Accessories for your Meat Smoker are a great way to make your Meat Smoking project easier. 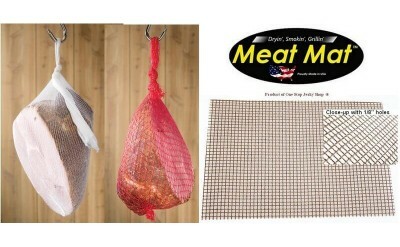 A Meat Mat™ from One Stop Jerky Shop is the cheapest and safest way to dry beef jerky in a smoker because they keep the meat from falling through the drying racks. Ham nets are great for hanging hams, turkey and chicken in the smoker.